I'm adding a new category to my site. Books. I like to read. I read a lot of Stephen King. His Dark Tower Series is fantastic. I absolutely loved how he tied the Dark Tower into so many of this other books. So, in this category, I'm going to include content (content is king) about books I've read. On a recent flight back from Bellevue, Washington, I saw that King had a new book out. I don't remember if I'd heard about it prior to seeing it in the airport, but I picked up Stephen King's Cell. Right now you should take a minute to support the OpenBSD Project. Chances are, if you're viewing my website (geek! ), you've used their work. They've developed OpenSSH. This software is included with operating systems from Apple Mac OS X to Redhat Enterprise Linux to Sun Solaris (pretty much all of them but Windows) as well as HP, Cisco and other hardware vendors' devices. These operating system and hardware companies have been including OpenSSH with their products for years, which saved them the time to develop it on their own. And that's just OpenSSH. I'm not even going to get into why OpenBSD deserves your support... that should be self evident through the rest of the content on my site. The OpenBSD team has released patches for sendmail on OpenBSD 3.9 (to be released May 1), 3.8 and 3.7. I've created a binpatch for 3.8. I've added OpenBSD Errata information to the sidebar on my site. I use a cron job to download the errata web pages from http://www.openbsd.org/errata.html (and, errata38.html, etc) once every three hours. I have a screen scraping script I modified to create an RSS feed for the OpenBSD Errata. Finally, I use the GetRSS plugin to display the feed on my Wordpress pages. I've finally finished moving erdelynet.com to a new server. It's slightly faster. The biggest benefit, though, is that I'm now hosting erdelynet.com in my house. I now have business-class FiOS service through Verizon. With that, I get static IP addresses and they don't block any ports. Access to email and my web site should feel a little faster because I've got a 15/2 Mbps pipe all for erdelynet.com. Previously I was sharing a T1 (1.5/1.5 Mbps) with other customers of the ISP. OpenBSD 3.9 Pre-Orders have been activated on the OpenBSD Orders page. Theo DeRaadt announced that people can pre-order the upcoming OpenBSD 3.9 release which will be released May 1, 2006. The OpenBSD project needs your support, so buy a shirt, buy a CD, make a donation! This software is well written, free and secure. But, the project needs your help to make this continue. I just bought one of the brand new Intel-based, dual-core Apple Mac Minis. It's fast! I upgraded my Mac Mini, at the time of purchase, to 1 GB RAM and 120 GB hard drive. It has such a small footprint on my desk. It's sitting right next to my 19" flat panel monitor and looks awesome. 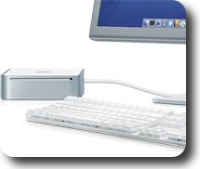 It has 4 USB 2.0 ports and a firewire port. It has an Airport (which I'm not using) for wireless access and a 10/100/1000 Ethernet port (which was NICE for transferring data from my PowerBook at 1 Gbps.